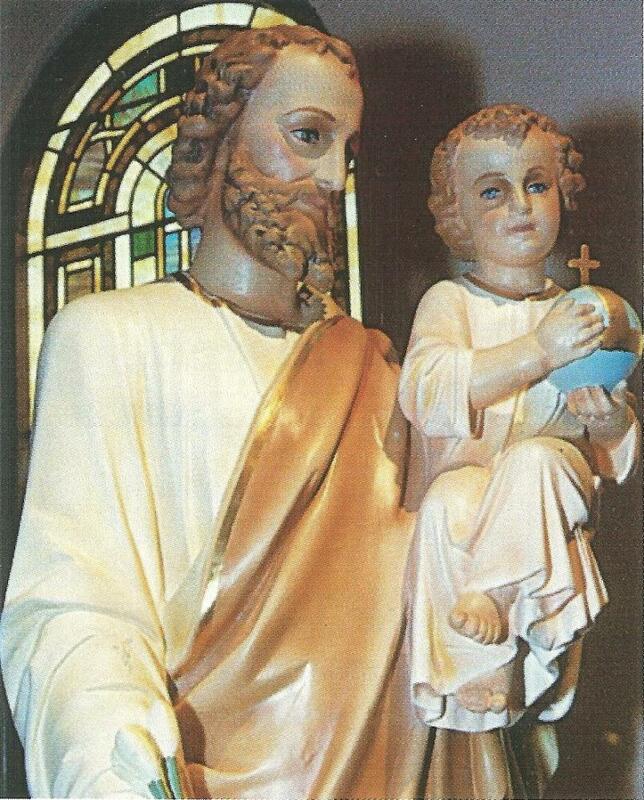 Saint Joseph, patron of the universal church, watch over the church as you watched over Jesus, help protect it and guide it, as you did with your adopted son. We know he was a carpenter, a working man, for the skeptical Nazarenes ask about Jesus, "Is this not the carpenter's son?" (Matthew 13:55). He wasn't rich for when he took Jesus to the Temple to be circumcised and Mary to be purified he offered the sacrifice of two turtledoves or a pair of pigeons, allowed only for those who could not afford a lamb (Luke 2:24). Despite his humble work and means, Joseph came from a royal lineage. Luke and Matthew disagree some about the details of Joseph's genealogy but they both mark his descent from David, the greatest king of Israel (Matthew 1:1-16 and Luke 3:23-38). Indeed the angel who first tells Joseph about Jesus greets him as "son of David," a royal title used also for Jesus. We know Joseph was a compassionate, caring man. When he discovered Mary was pregnant after they had been betrothed, he knew the child was not his but was as yet unaware that she was carrying the Son of God. He knew women accused of adultery could be stoned to death, so he resolved to send her away quietly to not expose her to shame or cruelty. However, when an angel came to Joseph in a dream and told him, 20 "Joseph son of David, do not be afraid to take Mary home as your wife, because what is conceived in her is from the Holy Spirit. 21 She will give birth to a son, and you are to give him the name Jesus, because he will save his people from their sins," he did as the angel told him and took Mary as his wife. (Matthew 1:19-25). When the angel came again to tell him that his family was in danger, he immediately left everything he owned, all his family and friends, and fled to a strange country with his young wife and the baby. He waited in Egypt without question until the angel told him it was safe to go back (Matthew 2:13-23). We know Joseph respected God. He followed God's commands in handling the situation with Mary and going to Jerusalem to have Jesus circumcised and Mary purified after Jesus' birth. We are told that he took his family to Jerusalem every year for Passover, something that could not have been easy for a working man. Since Joseph does not appear in Jesus' public life, at his death, or resurrection, many historians believe Joseph probably had died before Jesus entered public ministry. According to the Catholic Encyclopedia, the Apocryphal Date for Joseph's birth is 90 BC in Bethlehem and the Apocryphal Date of his death is July 20, AD 18 in Nazareth. Joseph is the patron saint of the dying because, assuming he died before Jesus' public life, he died with Jesus and Mary close to him, the way we all would like to leave this earth. Joseph is also patron saint of the Universal Church, families, fathers, expectant mothers (pregnant women), travelers, immigrants, house sellers and buyers, craftsmen, engineers, and working people in general. We celebrate two feast days for Joseph: March 19 for Joseph the Husband of Mary and May 1 for Joseph the Worker. March 19 has been the most commonly celebrated feast day for Joseph, and it wasn't until 1955 that Pope Pius XII established the Feast of "St. Joseph the Worker" to be celebrated on May 1. This is also May Day (International Workers' Day) and believed to reflect Joseph's status as the patron of workers. Many places and churches all over the world are named after St. Joseph, including the Spanish form, San Jose, which is the most commonly named place in the world. Joseph is considered by many to also be the patron saint of the New World; of the countries China, Canada, Korea, Mexico, Austria, Belgium, Croatia, Peru, Vietnam; of the regions Carinthia, Styria, Tyrol, Sicily; and of several main cities and dioceses. In art, Joseph is typically portrayed as an older man, with grey hair and a beard, often balding, sometimes appearing frail and a marginal figure next to Mary and Jesus, if not entirely in the background. Some statues of Joseph show his staff topped with flowers. St. Joseph is shown with the attributes of a carpenter's square or tools, the infant Jesus, his lily blossomed staff, two turtle doves, or a spikenard. There is much we still wish we could know about Joseph -- exactly where and when he was born, how he spent his days, exactly when and how he died. But Scripture has left us with the most important knowledge: who he was -- "a righteous man" (Matthew 1:18). Joseph was foster father to Jesus. There are many children separated from families and parents who need foster parents. Please consider contacting your local Catholic Charities or Division of Family Services about becoming a foster parent. The first Catholic settlers in Slater came from Fort Dodge, IA. The first Mass in town was celebrated in the fall of 1879 in the Chicago and Alton Railroad section house. Other places were used including the public school building and a carpenter shop. In May of 1882, the president of C & A Railroad, donated the site where the present church is located. On March 13, 1883, the first church was completed and dedicated. 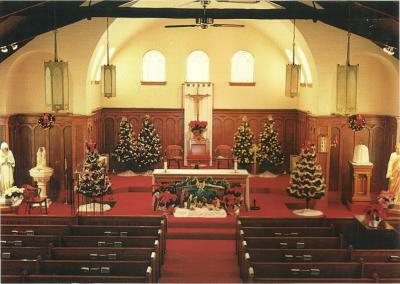 Plans for a new church began as the congregation grew. The cornerstone of the present church was laid September 7, 1925 with the first Mass celebrated on Easter Sunday 1926 (dedicated May 15, 1927). Extensive remodeling of the interior was completed in 1971. The church steps have been changed twice and were removed in 1986 to install a ramp entrance. The interior was again renovated in 1999 and is currently receiving a complete restoration of the original stained-glass windows.